No police or soldiers will be charged in connection with the murder of Belfast solicitor Pat Finucane, the Public Prosecution Service has said. Mr Finucane, 39, was shot dead at his home by loyalist paramilitaries, the Ulster Defence Association, in 1989. The killing was one of the most controversial of the 30 years of the Troubles in NI because of allegations of security force collusion. The PPS said insufficient evidence was "critical" in its decision. Mr Finucane's son, Michael, said the decision was "extremely disappointing and in some cases very, very perplexing". "I think the DPP has taken a very soft and very submissive approach to the manner in which prosecutions would be mounted," Mr Finucane said. He said some of the reasons given for not proceeding did not make sense. The "Stevens Three" report published in 2003 stated that rogue elements within the police and Army in Northern Ireland helped loyalist paramilitaries to murder Catholics in the late 1980s. However, in a statement on Monday, the Public Prosecution Service said no further prosecution would be brought against any individual. It said some of the difficulties in bringing charges included absence of records and the death of potential witnesses. Sinn Fein's Alex Maskey said: "This is an absolute scandal that no action is being taken. "People are being told that while the state was involved in the murders of their loved ones, no prosecution will be taken." The SDLP's Alban Maginness said the PPS decision was "outrageous" and "the mother of all cover-ups". He called on the incoming prime minister, Gordon Brown, to announce a fully independent inquiry into Mr Finucane's murder. 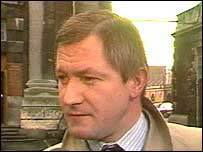 In 2004, the then Secretary of State for Northern Ireland, Paul Murphy, announced that Mr Finucane's death would be the subject of a inquiry. Meanwhile, the PPS also confirmed information about weapons handed over to police by William Stobie, who admitted supplying guns used in Mr Finucane's killing. It said weapons deactivated after Stobie, a former UDA quartermaster, gave them to his police handlers in 1989 were later used in loyalist killings. Investigators had examined the conduct of RUC officers and a civilian employee in relation to the possession and handling of five guns. The Stevens team uncovered evidence that two of the batch were either partially or fully deactivated before being handed back to Stobie. One of the guns, a Browning pistol, was later reactivated and used to kill Catholic man Aidan Wallace in west Belfast in 1991. Less than three months later, in south Belfast, the same weapon was used in the Sean Graham's bookmakers massacre, when UDA gunmen shot dead five people. 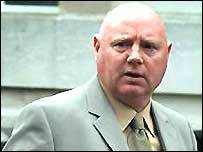 Stobie was shot dead outside his home in 2001 just weeks after the court case against him collapsed. Only one man has been convicted of killing Mr Finucane. Ken Barratt, 44, was jailed for 22 years in 2004 but released from jail in May last year. He is understood to be living at a secret location in England.